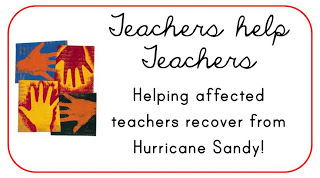 Thanks to Pinterest I discovered this wonderful blog that has set-up a way for teachers to help teachers who were affected by hurricane Sandy. The one requesting help fills out a form with information about where they teach and how Sandy affected them. The teachers who want to help fill out a form (love those forms!) giving information about products they will donate and the grade level. I’ve joined this worthy project. If you want to join, please click on the link above for more information.